Home Tags Posts tagged with "Stalik Khankishiev"
Here’s a recipe I’d like to share before morel season is well and truly over! Morels are among my favorite mushrooms, and even if some species are more flavorful than others, they rarely disappoint when they’re bought fresh and handled properly. And with two elements each calling for a generous amount of these delectable fungi, my recipe gives you a double dose all in one plate. First, there are the “strudel” kebabs, inspired by a recipe in Stalik Khankishiev’s Mangal cookbook. Mangal is definitely not Stalik’s best book. It’s pretty thin, and many recipes are just rehashes of dishes from the cookbook trilogy that made him famous. Some of the remaining recipes are available verbatim on his LiveJournal page, which sometimes even has more pictures! The strudel kebabs (called kebabs instead of shashlyk for reasons unknown) falls into the latter category; you can read all about it here. I’m always game for a new kebab/shashlyk idea, but I’ve got a few problems with this one as first presented. Calling it “strudel” is really a stretch: it’s just a thin piece of meat spread with some kind of compound butter, and then rolled — but, well, you don’t call jelly rolls strudels, do you? Then Stalik’s recipe recommends using butter mixed with truffle paste. Come on, Stalik! Truffle paste? Seriously? The overpriced mix of random mushrooms boosted with artificial truffle flavor? Is that really the best you can do, when Uzbek cuisine already uses other outstanding wild mushrooms like morels? When morels in Uzbek cuisine are used specifically because of their meaty taste? Doesn’t that sound like the perfect match for a kebab? 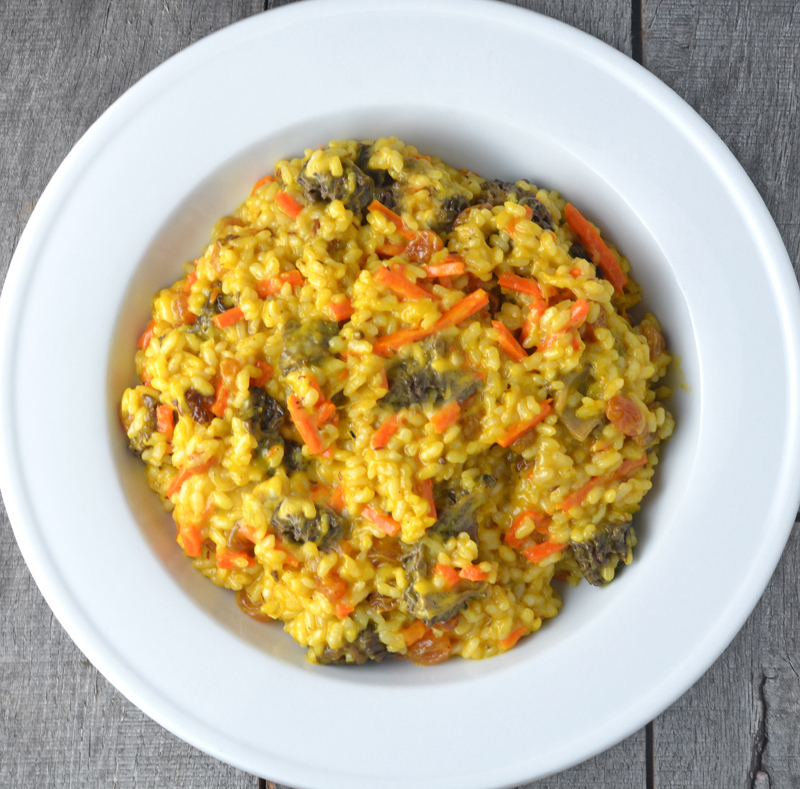 Next, speaking of morels in Uzbek cooking, I’m serving a vegetarian morel plov on the side. There are quite a few recipes floating around for qo’ziqorin palov (mushroom plov in Uzbek), like this one. Especially with morels. 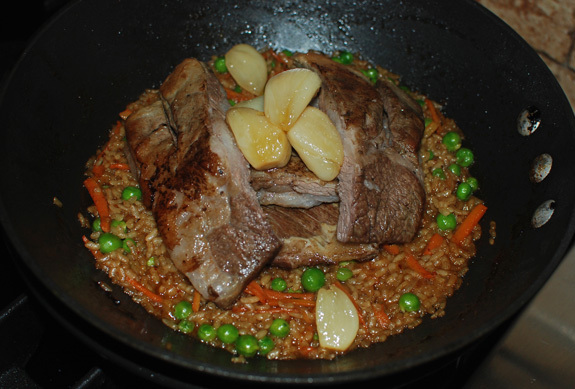 Using a couple of appliances that you don’t find in the typical Uzbek kitchen, you can make an amazing plov in no time. Boost the carrot flavor with carrot juice, freshly made with a juice extractor (okay, okay, or get it store-bought). It beats truffle paste any day, Stalik. And follow Nathan Myhrvold’s suggestion in Modernist Cuisine at Home: cook the rice in a pressure cooker in a matter of minutes, for a result that surpasses the hour-long kazan method. Of course the classic Uzbek spices are still there, coriander seed and zira (wild cumin). I even found a source for wild cumin in North America! Sure, you could just serve the kebabs with the usual grilled vegetables, but this plov makes for a really great pairing. Place the onion in an oven dish, and bake in a 200 C / 400 F oven for 1 1/2 to 2 hours, until tender when poked with knife. Let cool 5 minutes. Peel the onion, coarsely chop, and transfer to a blender. Add the butter, salt, and black pepper, then process until smooth. Reserve. In a small saucepan over medium heat, bring the heavy cream to a simmer. Progressively whisk in the diced butter until homogeneous, then remove from the heat. Carefully wash the morels under cold water. Chop about 1/3 of them, and keep the rest whole or halved, depending on their size. Place the morels and butter mixture into a sous-vide pouch, vacuum-seal, then cook in an 85 C / 185 F water bath for 30 minutes. In a pan over medium heat, toast the wild cumin and coriander seeds until fragrant, then reserve. In the pot of a pressure cooker over medium heat, heat the canola oil and morel butter. Add the garlic, onions, and carrot, season with salt, and sauté until soft. Stir in the rice, raisins, wild cumin, and coriander. Add the white wine, then bring to a simmer, and cook for one minute. Add the carrot juice and vegetable stock. Cover the pressure cooker, bring to pressure, and cook for 4 minutes. Release the pressure (you can run cold water over the pressure cooker to help), and reserve. At this point, the rice should be parcooked. Heat the pot containing the plov base over medium heat. Mix in the onion purée, the cooked morels, and the remaining morel butter. Season with salt and pepper. Add the vegetable stock, and cook until the liquid is fully absorbed and the rice is tender, stirring occasionally. This only takes a couple minutes; add a little bit more stock if the rice isn’t fully cooked. Carefully wash the morels under cold water, then cut into medium dice. Take the mixture out of the pouch and transfer to a blender. Add the salt, and process until smooth. Let cool, then refrigerate for at least 2 hours. Cut the beef tenderloin lengthwise into 0.5-1 cm thick slices. Using a meat pounder, gently flatten the first and last slices in order to even out their thickness (the tenderloin being shaped like a log, these slices are going to be thicker in the middle). This gives you long rectangular slices of meat. Mine were approximately 28 cm x 8 cm. Season the slices with salt and pepper on both sides. Spread each slice with a generous amount of morel paste on one side, then roll into a cylinder. Cut each roll in half crosswise (otherwise the pieces will be too large to easily fit on the mangal). Don’t worry if some of the morel paste leaks out, just leave it! 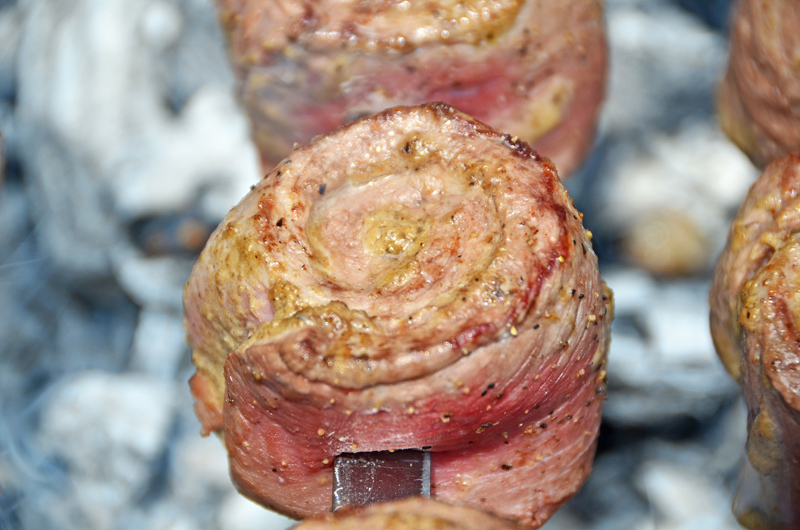 Place the meat onto wide skewers, piercing through all the meat layers (as shown in the picture below), and reserve. 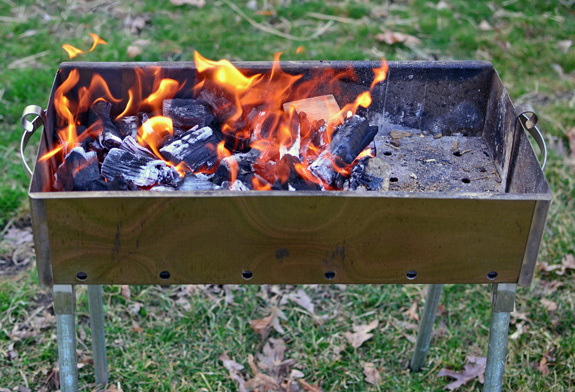 Make a wood charcoal fire in a mangal, and wait until the flames have just died (see here for more detailed instructions). You want the fire to be pretty hot. 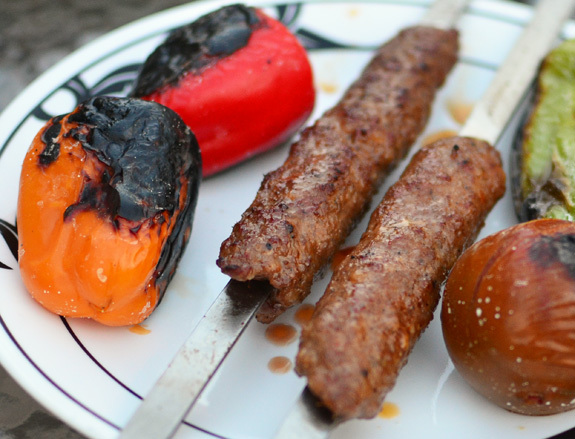 Grill the kebabs over the coals, turning frequently, and resting the meat once for a few minutes when half-way done. Since this is fillet mignon, I encourage you to cook the meat rare. Serve immediately. A note about my restaurant reviews: New York City counts many Eastern European restaurants scattered across the five boroughs, most of them ignored by restaurant critics and diners alike. I intend to visit as many as I can and report! 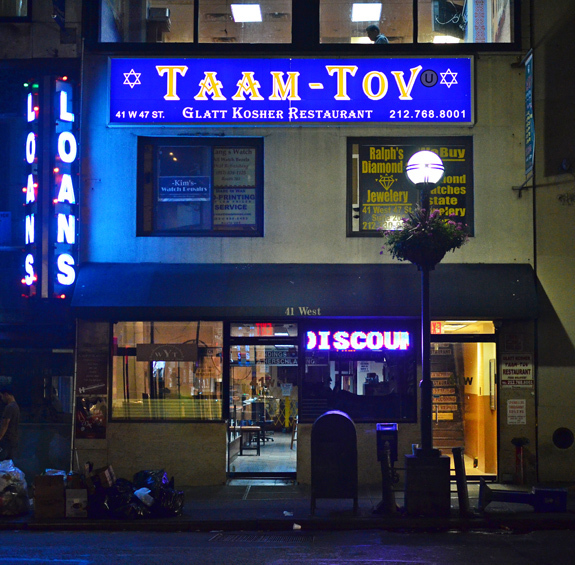 Taam Tov, in Midtown West, is probably the only Uzbek restaurant in Manhattan. More precisely, they serve Bukharan kosher cuisine, and the name means good taste in Hebrew. It’s not in a particularly attractive location — this is one of the neighborhoods I like the least, and most people would probably agree — but getting there is a considerably faster journey than getting to Rego Park. I’ve often spoken of lyulya-kebabs, whether to criticize the ones I’ve eaten in New York restaurants (such as here, here, or here), or to sing the praise of the ones I’ve had in Azerbaijan (here and here). 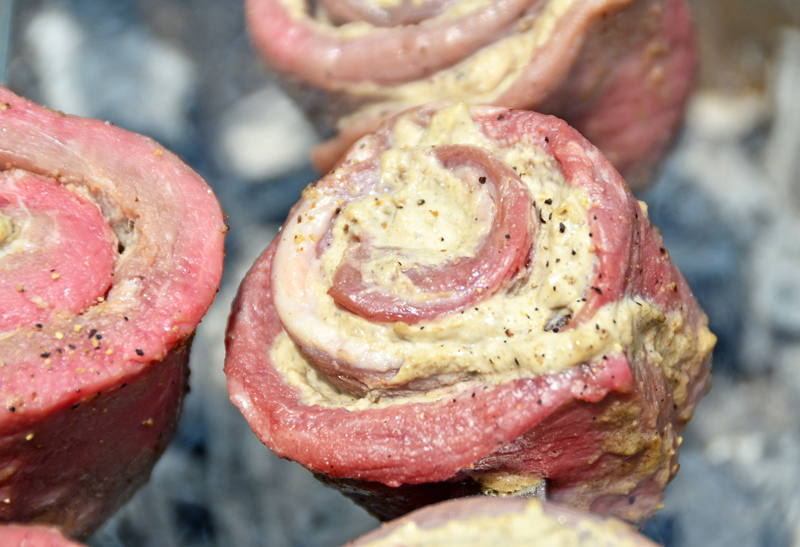 Truth be told, it’s not all that easy to excel at preparing those skewers of ground lamb, partly because they need to satisfy two diametrically opposed criteria. On the one hand, you want the meat to be moist, juicy, and airy. On the other, the whole dish is a challenge to the laws of gravity — do you know many other dishes that consist of hanging plump cylinders of ground meat on a stick horizontally over an open pit??? I shall now present to you this epic, 4-years-in-the making post — the ultimate reference for the Western lyulya-kebab aficionado! Buy meat from the shoulder or the breast [I couldn’t agree more], that’s so fresh it’s never been refrigerated [easier said than done, not to mention that aging meat is essential to its taste]. Trim all the fat and silverskin from the lean meat. Mix the lean meat, fat and onion, using 1000 / 200 / 150 as a guideline for the proportions. Season with salt, pepper and spices. For spices, don’t overdo it to preserve the taste of the meat. It is recommended that you use only cumin and coriander. [And the $1M test…] Take a small amount of the mixture, form a ball, and throw it against the wall of the mixing bowl. If the ball keeps its shape, you’re good, if it smashes, you’re screwed. Refrigerate the meat while you make the fire. You will need a pretty hot fire. [As opposed to most shashlyks, that are traditionally prepared on coals that are almost entirely consumed]. I am adding cooked rice to the mixture to make it airier, and to absorb some of the meat juices and grease that will run during cooking. This also gives me the opportunity to add stock for extra lamb flavor. I prefer cooking the onions before adding them to the ground meat, so I add them to the rice. I combine them with ground star anise, following Heston Blumenthal’s finding that it intensifies the meatiness of a dish. For the spices, besides the star anise, I choose one of my usual favorite peppers, Urfa pepper, for its delicious fruity and smoky taste. I do agree, however, that cumin is a great match with lamb. I also agree that you should avoid masking the taste of the meat with too many spices. Feel free to experiment on your own. Another flavor that I appreciate in great lyulya-kebab is a hint of tomato. I tried to use fresh tomatoes that I cooked with the rice, but it made the final mixture too soft to stay on the skewers, so I turned to tomato paste. I included transglutaminase in the ingredients. Obviously, nobody uses that in Azerbaijan! If you happen to have some, use it. If not, just omit it and be extra careful when you grill the kebabs. Finally, I should mention that I also experimented with xylitol, a naturally occurring sweetener with a scary chemical name. Studies have shown that adding 0.5% to 1% of the meat amount in xylitol to ground lamb makes the final result more pleasant to most tasters (plain sugar, on the other hand, makes it less pleasant). And I tend to agree, though of course it’s not exactly typically Azeri. Try it for yourself… Xylityol is available as a powder in vitamin stores. Traditional accompaniments would be lavash, thinly sliced onion with sumac, and grilled vegetables (by the way, the white traces on my vegetables are not ash, but salt). I’m adding my own touch here with a great charred eggplant purée. The picture above shows a piece of lamb breast. What I usually do is, separate the fat from the lean meat and measure the amount of fat I need. I then remove the silverskin from the lean meat, and I use some shoulder meat (like the one in this post) to complement if necessary. Sauté the onion in the rendered lamb fat in a saucepan over medium heat until soft but not colored. Add the ground star anise, stir for a minute, then add the tomato paste and stir for another minute. Mix in the rice, then add the stock and bring to a simmer. Cover with a lid, and cook over low heat, stirring occasionally, until the rice is very tender and the liquid fully absorbed. Remove from the heat, let cool to room temperature, and refrigerate. Char the eggplants on all sides over a gas burner or using a blow torch (or on the grill!). Let rest in a closed plastic container for 5 minutes. Chop the eggplants into large chunks. 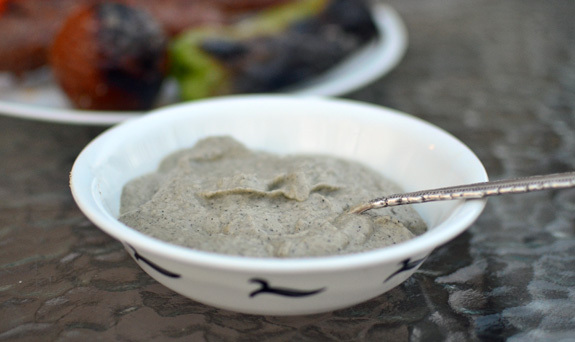 In a blender, process the eggplants, cheese, heavy cream, olive oil, lemon juice, smoked salt, cumin, and pepper. Pass through a chinois, transfer to a plastic container, and reserve. Reheat before serving. The purée should be warm but not piping hot. Grilling lyulya-kebabs requires some special gear. First off, the meat goes on broad, flat skewers (see my photos below). You can purchase some here or here (at least at the Sheepshead Bay Rd location). 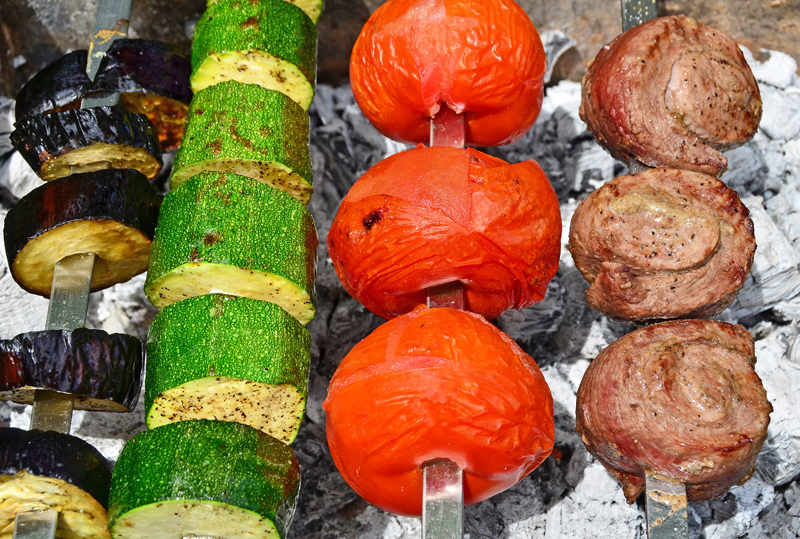 If you’re familiar with Brazilian barbecue, large blade churrasco skewers are also fairly similar. 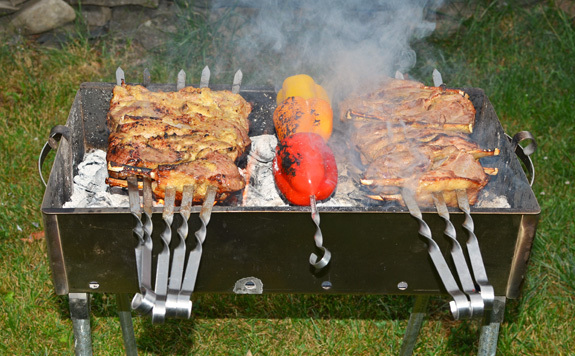 Second, you’ll need a barbecue with a removable grill plate, so skewers can be placed across, right above the coals. 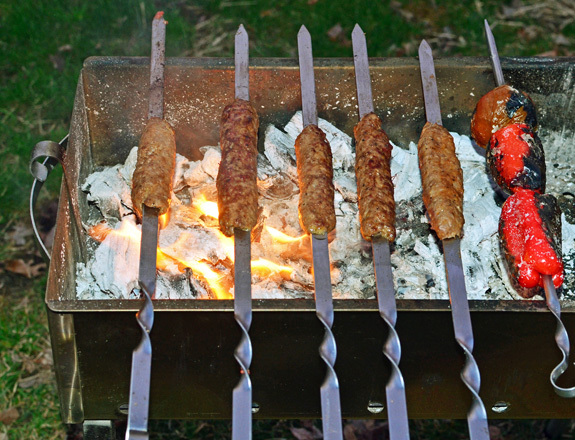 Ideally, you would have a mangal, like on the above picture (available here, too), but any grill that will fit your skewers will work. Time to make the fire. Do yourself a favor and skip the alcohol-soaked briquettes that stink up your backyard and your meat. At the very least, buy natural wood charcoal, the kind that don’t come in perfectly shaped ovoids. I like to go one step further and use wood chunks instead. If you use a starter, make sure it’s smell-free, too: odorless alcohol (typically sold in the paint department of your local hardware store), kindling, or newspaper all work well, with or without a chimney or a bellows. Shortly after all the flames have died, you are ready to grill— count about an hour for the whole setup. As Stalik said, you want the coals to be quite hot. To shape the lyulyas, dip your hands in hot water, then grab some meat and wrap it around a skewer. You can make the kebab as long as you want (within reason), but don’t make it too wide if you don’t want it to fall on the coals! Look at my close-ups — there’s just enough meat to form a comfortable blanket all around the metal. This also prevents the kebab from drying out while you cook it. Now, don’t go thinking your job is done once you place the skewers over the coals! 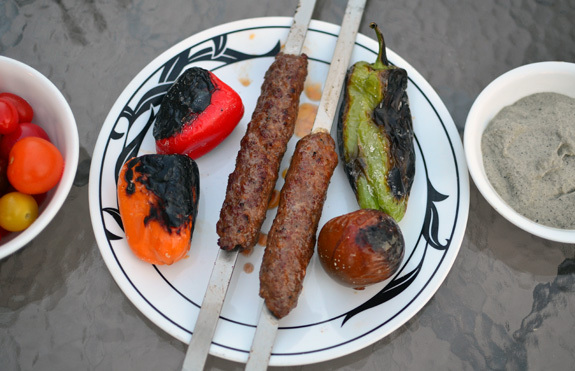 The kebabs need to be turned very frequently; according to Stalik, they should be turned whenever they get a shade darker, and whenever you see grease dripping on the coals. The goal is to keep them moist and stop the grease from causing too many flames that will burn the meat. Personally, I think that a few small flames licking the meat once in a while are OK and add some flavor, but only a few! FYI, the pictures above were taken at approximately 1 minute intervals [how scientific of me]. 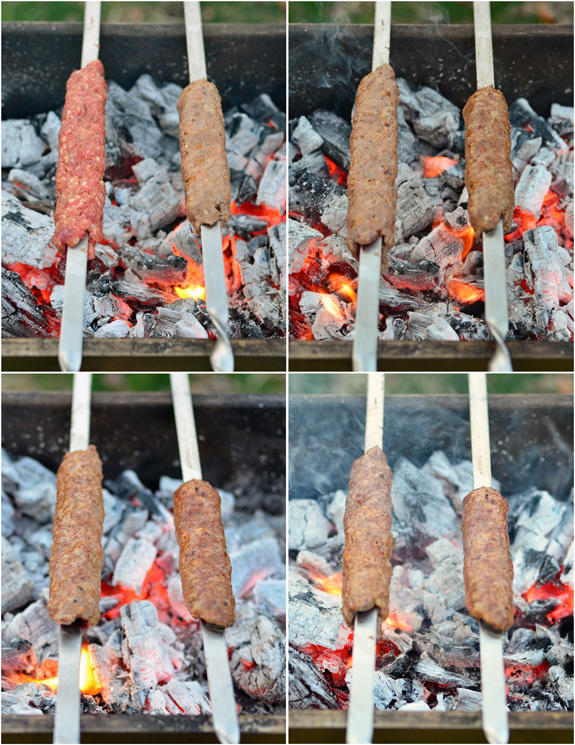 By the fourth picture, the skewer on the right is ready. As a matter of fact, the meat is ready when the outside is a nice medium-brown color, and the inside is at that point where it just turned from pink to grey — a lyulya-kebab cannot be served rare, but that doesn’t make it any less delicious. I recommend that you start small, a couple lyulyas at a time, and proceed with larger batches as you get more confident. Lyulya-kebabs have to be served and consumed immediately. They should not be eaten cold or reheated. To paraphrase Stalik Khankishiev one last time, human words aren’t enough to describe a good lyulya-kebab. The base ingredients are fatty lamb cuts, rendered lamb fat, carrots, onions, garlic, hot pepper and spices. Depending on the region and season, each recipe adds other ingredients like barberries, quince, chickpeas, eggs or even dolmas (vine leaves stuffed with meat). The rice is not steamed but cooked in a stew composed of the other ingredients, making the dish a complete meal. The dish is prepared in a kazan, a large cooking pot more or less similar to a wok. In his book Kazan, Mangal, and Other Manly Pleasures (sadly, only available in Russian), Stalik Khankishiev gives precise, abundantly illustrated recipes outlining the do’s and don’ts of plov making. The carrots must be cut into a julienne by hand. The ingredients must not be mixed while the plov is cooking. After rendering the lamb fat, the leftover chunks must be eaten with 100 grams of vodka! While following the spirit of Khankishiev’s recipes, I am doing a few things differently. Cooking the lamb sous-vide gives results far superior to anything one could achieve in a wok alone, and all the meat juices are eventually added into the dish. “My” garlic confit produces very tender cloves that can be eaten easily. 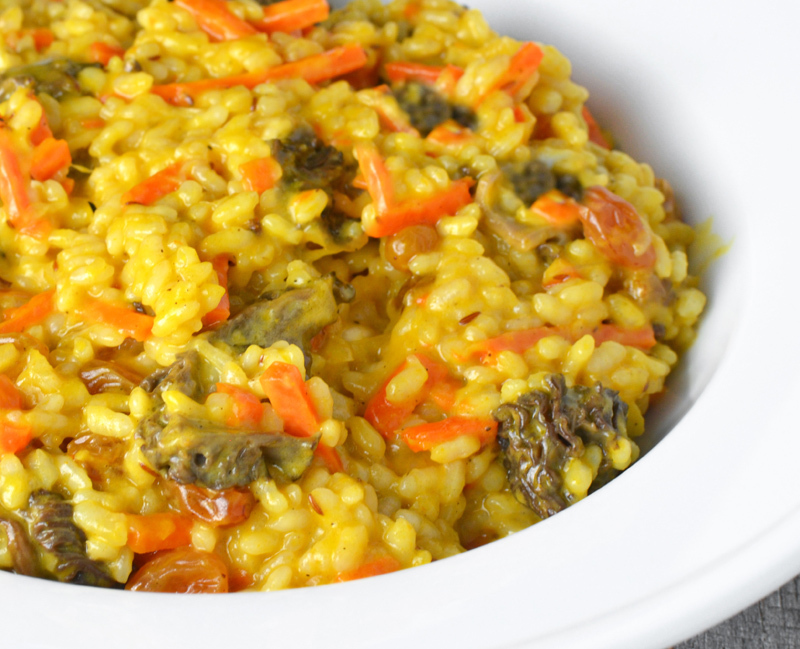 Instead of the Uzbek rice varieties, I am using paella rice, which absorbs considerably more liquid. When adding liquid to the rice, I prefer lamb stock to plain water. Finally, I am adding green peas for their delicious flavor and bright color (I blanch them separately, specifically to preserve their color). This is supposed to be a greasy dish. 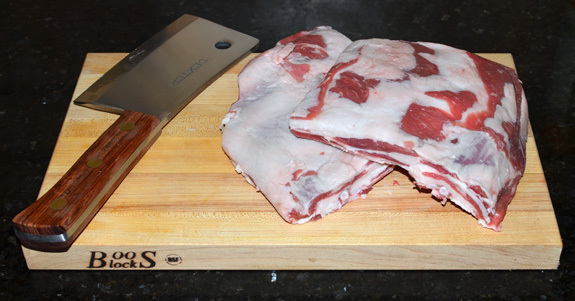 However, if you want to reduce the amount of fat, you can replace the lamb breast with lamb shoulder, and reduce the proportion of rendered lamb fat. Season the lamb breast with salt on both sides. Using a blowtorch, char the meat on both sides until soft and brown. Season with black pepper and place into sous-vide pouches with the rosemary. Cook in a water bath at 151 F for 24 hours. Rinse the rice under running water, then place into a bowl and cover with hot water. Reserve. Place the garlic and olive oil in a small saucepan, cover and cook over very low heat for about 30 minutes, until completely tender. Drain the garlic and reserve. The olive oil can be stored in the refrigerator for up to a week to be used in other recipes. Blanch the green peas in salted boiling water until soft, then shock in ice water, drain and reserve. Reheat the lamb breast sous-vide in the water bath until warm. Strain the liquid and reserve. Bone the lamb, discard the rosemary and reserve the meat. Heat a wok over high heat. Season the lamb meat with salt, sauté in the wok skin side down for about a minute, then flip and sauté for 30 seconds. Reserve the meat. Melt half of the lamb fat in the wok, add the onions, season with salt and cook over high heat until brown. Stir in the ground star anise, cumin, and piment d’espelette. Add the rest of the fat and the carrots, and cook until soft and golden brown, stirring regularly. Add the rice, the lamb stock and some more salt without stirring. Cook over high heat until the liquid is fully absorbed. Add the liquid from the lamb sous-vide, lower the heat to medium and simmer until the liquid is almost completely gone. Mix in the green peas, rectify the seasoning, turn off the heat, cover with a lid, and let stand for about 15 minutes. Arrange the meat and garlic on top of the dish, let rest covered for another minute, and serve.